She hosts a Blogger’s Cafe, too. This works on the same principle as the Handbag Gallery but this time showcases the blogs of a range of authors. I’ve been fortunate to be interviewed on Jessie’s blog and she’s posted one of my stories. You can read both here. All Jessie’s posts are accompanied by wonderful images to compliment the text. The care Jessie takes in presentation makes it an absolute delight to appear on her blog. To top all this, Jessie has just posted an outstanding review of Paisley Shirt. She’s taken prompts from my collection to write the review as a piece of flash fiction. This not only demonstrates her talents as a writer but is a wonderful tribute to my collection. I am absolutely thrilled and can’t thank Jessie enough. It’s well worth taking time to browse Jessie’s blog. It is a celebration of reading and writing where you’re bound to find something of interest. Two pieces of great news arrived this week. First I have a piece of short fiction published by the Cabinet of Heed. This is a wonderfully eclectic journal which is beautifully illustrated. Click on the photograph below for a link to my piece. The submission process for the Cabinet of Heed is unusual – it remains open until there are sufficient of well-crafted pieces to fill a new journal. It’s certainly worth submitting here for writers of short fiction and poetry. The other news is that I am the joint winner of a poetry competition run by The Student Wordsmith. This means I will work with founder, Sophie-Louise Hyde, to compile a poetry pamphlet for publication. Good things come in threes, too! I’ve had three anthologies drop through my letterbox this week. It’s always a thrill to see my creative writing appear in print and this time I have two pieces of short fiction and one poem to celebrate. Flash Fiction Festival One is an anthology of stories inspired by input at the first Flash Fiction Festival held in Bath during the summer 2017. Thank you to Jude Higgins as the director of this wonderful event and her team who have brought together flash fiction stories written by workshop presenters and participants. My story “Where There’s a Rick” draws upon a clash of events and memories and is told in just over 200 words. Glit-er-ary is the annual anthology published by Bridge House. It is a glittery collection of glit-er-ary tales that will add some sparkle to your reading. My story titled “Brighter Than Jewels” is set in Australia and draws upon the relationship between a mother and her teenage daughter. Under is a collection of poetry published by Miriam Dokotliver and David Ross Linklater. Within the enigmatic cover are poems in a range of forms and styles which make for great reading. So, good things come in threes, too! This time last year I was regularly travelling to Bournemouth to attend CPD training in workshop facilitation offered by Lit Up! Writing. (You can find a post about the programme here.) The latest Lit Up! initiative sees the publication of poetry and prose by writers living in Dorset and beyond. 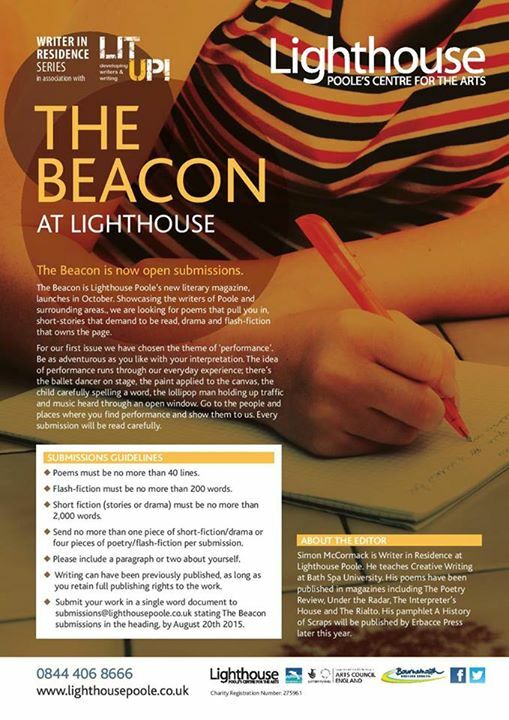 The Beacon, Issue 1 is an ingenious anthology compiled to reflect the theme of performance. Act 1 includes work by fellow Wimborne Writing Group members Mary Bevan and Richard Green. My flash fiction ‘Graft’ appears at the end of Act 2, while Kim West (who also attended the Lit Up CPD training) has a poem in Act 3. Biographies for the writers appear under ‘curtain call’. It’s a pleasure to have my work included in such an innovative anthology. Well done to Ben Johnson for putting it together. Copies of the anthology can be purchased here. In January, I joined a series of training sessions delivered by Simon McCormack as part of the Lit Up! project. The sessions to support skills and confidence in writing workshop facilitation were excellent and I met a very talented group of writers through the work. Simon is now writer-in-residence at Lighthouse, Poole, a centre that provides live events, films and visual art. As part of his new role, Simon has become editor of a new literary magazine titled ‘The Beacon’ which will launch in October. For writers in Poole and surrounding areas, see your work in print by entering submissions of poetry, flash fiction or short fiction with the theme of ‘performance’. For further details, please see the poster.